Mai Matsumoto (violin) was 16 years old when named the Winner of the Khuner Young Artists Concerto Competition in November 2016. She performed Tchaikovsky’s Violin Concerto in D major, Op. 35 at the Prometheus Symphony’s concert in January 2017, under the baton of Music Director Eric Hansen. Mai’s stunning performance of that virtuosic concerto made clear what a remarkably gifted musician she had already become. She began violin at the age of four at Toho Gakuen School of Music for Children in Japan, studying under Ami Watanabe. 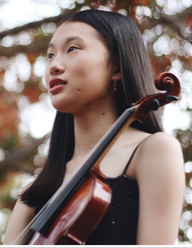 After her family moved to California, she was awarded a scholarship to the San Francisco Conservatory of Music Pre-College Division, where she has studied with internationally known violinist Zhao Wei as well as Bettina Mussumeli and Yukiko Kurakata. In 2016, she was named Principal Second Violin in the acclaimed San Francisco Symphony Youth Orchestra, were Andrew Lee, our 2016 Khuner Concerto winner, was serving as Concertmaster. When Mai won our challenging auditions in the autumn of 2016, she already had won Grand Prize and First Place in American String Teachers Association’s San Francisco/Bay Area Competition, the privilege of performing in the Junior Bach Festival and of being a finalist in Young Artists Division of the Mondavi Competition. Other honors achieved by age 16 included First Place in the International Music Competition of the Chinese Music Teachers Association of Northern California, First in the Young Artist Competition sponsored by Holy Names University and Diablo Valley College, and Second in the Pacific Music Society Competition. Beyond the Bay Area, Mai has attended the MERIT Program of Music Academy of the West in Santa Barbara. At the Aspen Music Festival, she studied with the famed Midori and Naoko Tanaka. She won Honorable Mention in the Miami-based National Young Arts Foundation 2017 competition. In addition to perfecting her solo performances for these demanding competitions, Mai is an active chamber musician, including an appearance with her string quartet on National Public Radio’s “From the Top” program in 2015. We look forward to learning more about Mai as she advances her music career.